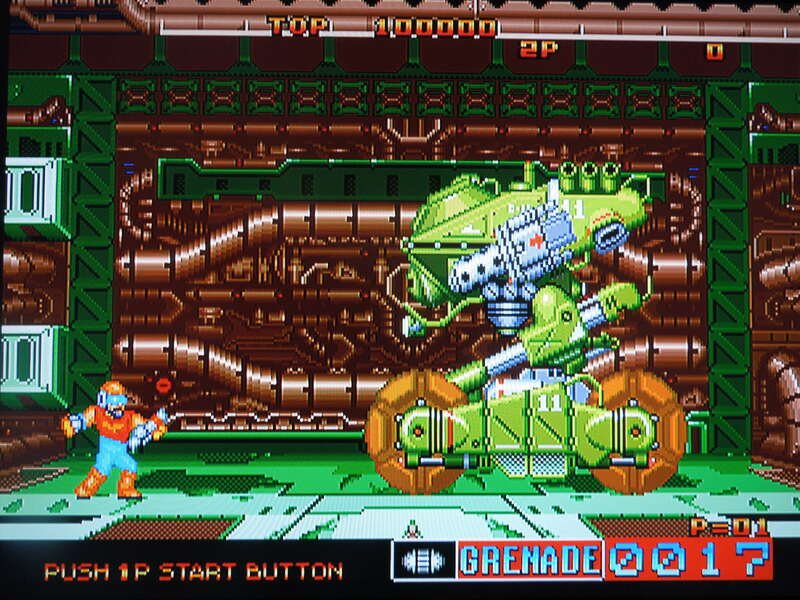 Cyber-Lip was released for the Neo Geo AES (shown here), MVS (arcade cabinet), and CDZ. Note 1: Like shooting games? Check out my reviews of Operation Wolf and Shock Troopers: 2nd Squad! 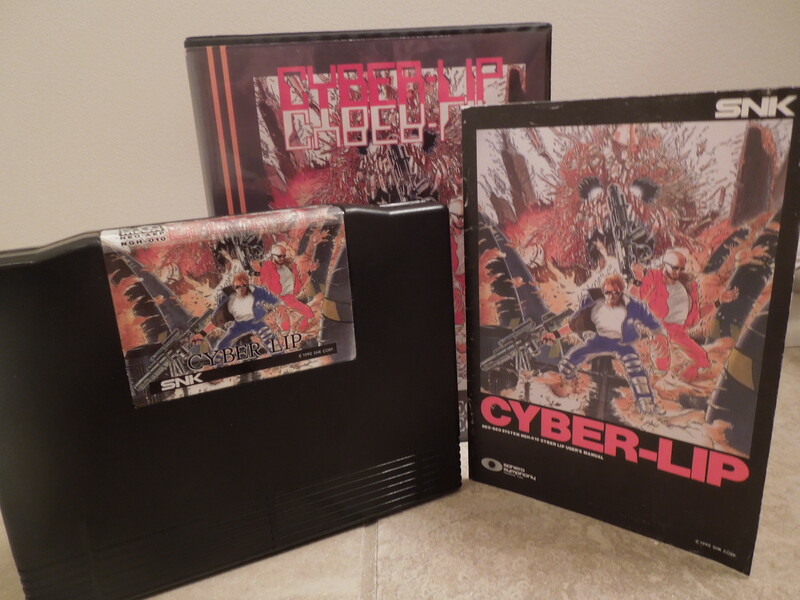 Quick History: Cyber-Lip was released for the Neo Geo AES home console in 1990. It is a ‘Run ‘n’ Gun’ shooter that has similarities with more well-known games such as Contra for the NES or Contra III for the SNES. Players: For 1 player or 2 players (co-op gameplay). 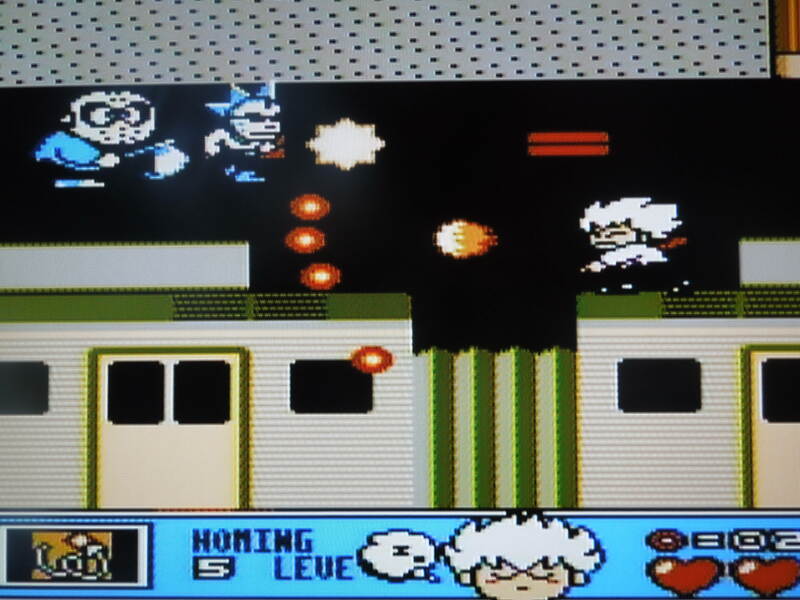 Player 1 controls Rick, the White guy with spiky blonde hair. Player 2 controls Brook, the Black guy with a shaved head. The good thing about the Neo Geo AES is that either control port can start or pause the game, meaning you can be either character in Cyber-Lip if you’re only playing a 1 player game by simply plugging the controller into port 1 or port 2. Neo Geo Memory Card: Cyber-Lip is compatible with the Neo Geo Memory Card. If you choose not to continue after losing all of your lives, and the counter counts down to zero, then you will be presented with the option to save your game from your present location. If you were in the middle of a stage, you will return to the start of that stage later by loading your save data, and if you were at a boss fight, you can re-start later at the boss fight. Cyber-Lip must be destroyed…and learn to articulate his speech better. Story: Cyber-Lip, for a Run ‘n’ Gun game, has an interesting story that is presented in the ‘Demo’ at the beginning of the game (don’t press Start to see the story). Essentially, in the year 2016, Earth’s leaders developed a space colony to handle the issue of their overpopulated planet. By 2030 though, the colony had problems, as the cyborgs the humans created to protect their colony began to malfunction, and aliens began to invade the colony at the same time. To deal with this, a supercomputer with artificial intelligence known as ‘Cyber-Lip’ was built and put in charge of the human space colony to fix the cyborgs and fend off the aliens. The problem was, though, that Cyber-Lip soon began to malfunction and turned on the humans of the space colony. That’s where you come in. The President sends two humans, Rick and Brook, to the space colony to destroy the corrupted cyborgs, kill any invading aliens they find, and finally destroy the evil supercomputer, Cyber-Lip. SPOILER: At the end of the game, after destroying Cyber-Lip, Rick and Brook learn that the President was actually an alien the entire time (Plot Twist!) and had tampered with Cyber-Lip as a way to get Rick and Brook to go in and destroy it and the human space colony. Now, the ‘President’ and his race of aliens will invade Earth and conquer the rest of the human race. The end. This is one of the only games I’ve ever seen with a ‘bad’ ending – it’s actually quite cool – Rick and Brook thought they were saving the day, but were really just pawns in the aliens’ plans to conquer Earth. The bazooka is the most powerful gun in the game. Controls: Cyber-Lip uses 3 of the Neo Geo AES’ 4 main buttons (in addition to the control stick, Select button for ‘Pause,’ and Start button for starting the game and continuing after you lose all of your lives): A, B, and C. Button D has no function in this game. A fires your weapon. B jumps (holding Up + B does a really high jump). B + Down hops down from a ledge (if you’re on one) or does a ‘tuck and roll’ if you’re on the ground. C changes which gun you’re using. You can fire up, down, left or right, but not diagonally. Guns and Core Bots: As you kill cyborgs and aliens in Cyber-Lip, you’ll collect different gun icons. You start with a ‘Normal’ gun, which shoots a straight shot as you rapidly press button A. You’ll collect icons with letters A (Auto – hold button A for rapid-fire ‘Normal’ shots), F (flamethrower), W (Wideshot – spread gun), B (Bazooka – most powerful gun), or G (Grenade – you can lob these at hard to reach enemies – quite a strong attack). You have unlimited ‘Normal’ shots, but you’ll have limited ammo for the other guns you find – ammo can be restocked in some stages by entering doorways with ‘IN’ marked on them. Additionally, you’ll sometimes find Core Bots – little orbs that constantly circle your character and protect you from enemy fire – although you can still die by touching an enemy or falling off a cliff, or if a bullet isn’t blocked by the circling Core Bots. You can collect more than 1 core bot for extra protection. 2 Player Co-op enhances Cyber-Lip’s gameplay. 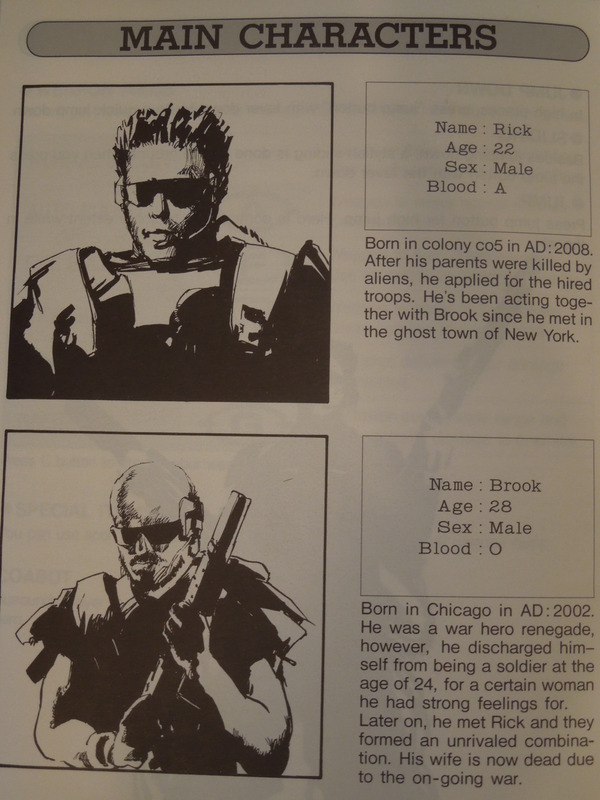 Rick and Brook are the only soldiers tough enough to stop Cyber-Lip (from the game manual). Lives and Unlimited Continues: You are given 3 lives to start the game. Lose all 3, and you’ll have the choice to continue. Unlike many other Neo Geo AES games, Cyber-Lip gives you unlimited Credits, meaning you can continue after every 3 lives you lose. You have a high score in the game, and every time you choose to continue, it will reset to zero. Difficulty? Cyber-Lip for the Neo Geo AES home console does not offer a selection of different difficulty levels, like many Neo Geo AES games. Having played the game through many times, I would best describe its difficulty as ‘Normal,’ and that may well be what it’s BIOS inside the cartridge is set to. Game Length: There are 7 stages in Cyber-Lip, and at various points you’ll be asked to go up or down on an elevator. If you choose the ‘wrong’ direction, you’ll play an extra area of the game. 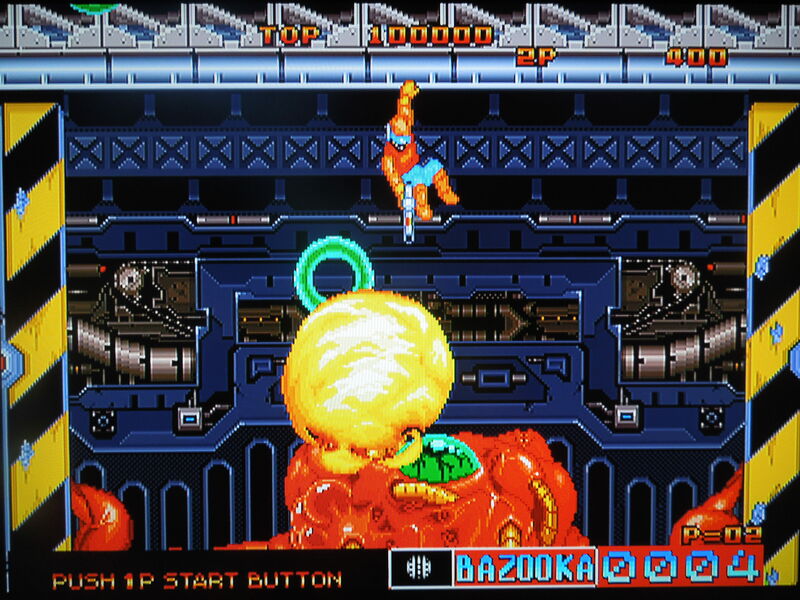 Even with these optional (although random) areas, it only takes around 30 minutes to play Cyber-Lip all the way through. 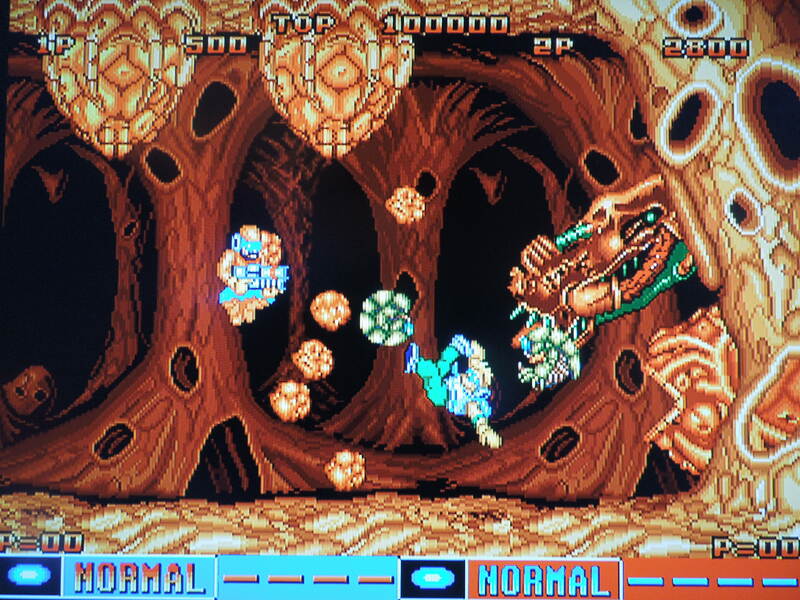 Bosses: Each stage ends with a boss fight – typically something large and mechanical, or a giant alien. At the end of stage 7, you have a choice of 8 doorways to enter. 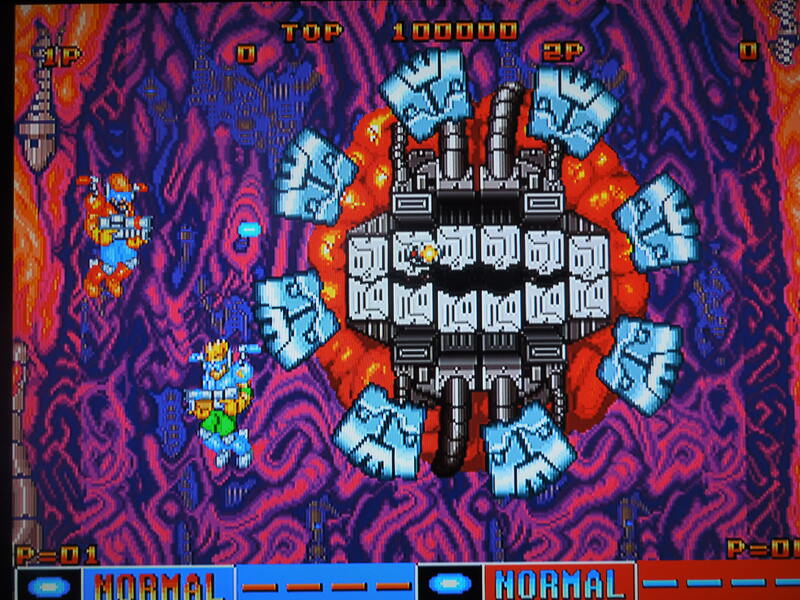 One contains the final boss, Cyber-Lip, and the others contain the game’s previous bosses or a stock room of ammo for your guns. This means that you may have to fight some, all, or none of the previous bosses again. The location of Cyber-Lip is random. So, where can I find this game? You can find AES and MVS versions on eBay, and there was a CD version released for the Neo Geo CDZ. Also, the game is available as one of the 20 pre-installed games on the Neo Geo X handheld console. You can also play the rom on a computer emulator. Destroying Cyber-Lip leads to an unexpected ending. 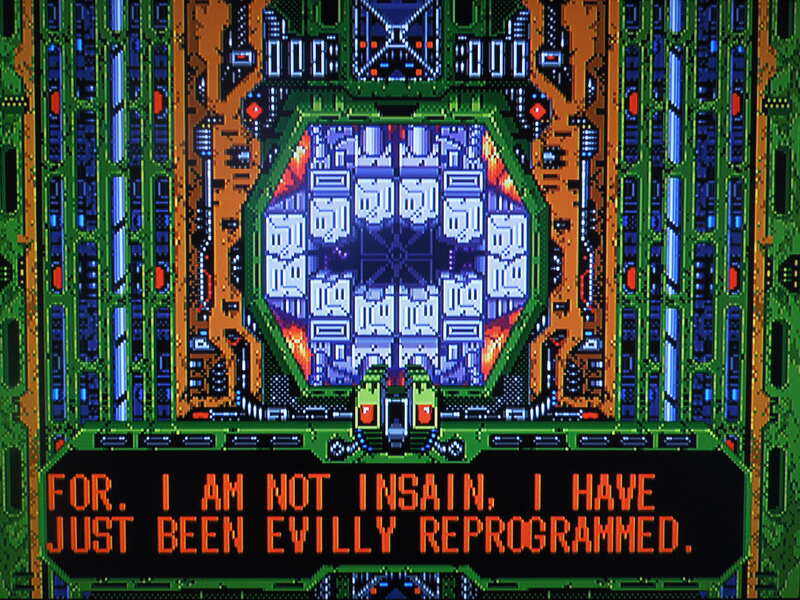 Conclusion: Cyber-Lip was one of the first Neo Geo AES games released. In fact, in the back of the game manual, it reads, “This product can only be used with the NEO GEO Rental System.” Because of this, comparatively, it is no true match for other Run ‘n’ Gun games like Metal Slug or Shock Troopers: 2nd Squad that came out later. However, sometimes comparing games to similar games isn’t always fair (my personal opinion), and the truth is, Cyber-Lip is a fun game, if simple. It’s challenge level is almost perfect, but there are areas where you have to be careful of ‘cheap’ deaths – they are avoidable, but only if you’re extremely careful. The game would be better if it didn’t give you unlimited Credits, but trying to beat the game using only 1 Credit (3 lives) makes for a good challenge. Co-op gameplay is a big plus, as always. The story, also, has a creepy, sci-fi feel. This entry was posted in Neo Geo - Cyber-Lip and tagged Cyber-Lip Review Neo Geo AES. Bookmark the permalink.